We’d love your help. Let us know what’s wrong with this preview of Stanton by Walter Stahr. Walter Stahr, award-winning author of the New York Times bestseller Seward, tells the story of Abraham Lincoln’s indispensable Secretary of War, Edwin Stanton, the man the president entrusted with raising the army that preserved the Union. Of the crucial men close to President Lincoln, Secretary of War Edwin Stanton (1814–1869) was the most powerful and controversial. Stant Walter Stahr, award-winning author of the New York Times bestseller Seward, tells the story of Abraham Lincoln’s indispensable Secretary of War, Edwin Stanton, the man the president entrusted with raising the army that preserved the Union. Of the crucial men close to President Lincoln, Secretary of War Edwin Stanton (1814–1869) was the most powerful and controversial. Stanton raised, armed, and supervised the army of a million men who won the Civil War. He organized the war effort. He directed military movements from his telegraph office, where Lincoln literally hung out with him. He arrested and imprisoned thousands for “war crimes,” such as resisting the draft or calling for an armistice. Stanton was so controversial that some accused him at that time of complicity in Lincoln’s assassination. He was a stubborn genius who was both reviled and revered in his time. Stanton was a Democrat before the war and a prominent trial lawyer. He opposed slavery, but only in private. He served briefly as President Buchanan’s Attorney General and then as Lincoln’s aggressive Secretary of War. On the night of April 14, 1865, Stanton rushed to Lincoln’s deathbed and took over the government since Secretary of State William Seward had been critically wounded the same evening. He informed the nation of the President’s death, summoned General Grant to protect the Capitol, and started collecting the evidence from those who had been with the Lincolns at the theater in order to prepare a murder trial. To ask other readers questions about Stanton, please sign up. An interesting, sympathetic and well-written biography of Stanton. Much of the book deals with the Civil War and Andrew Johnson’s impeachment (the war takes up most of the book, actually), but this is still a great portrait of the man. The narrative is compelling, and Stahr has a great grasp of the time period. His treatment of Stanton is balanced; while he often bent the rules and occasionally played both sides of the fence politically, he did contribute much to the Union victory. He comes off a An interesting, sympathetic and well-written biography of Stanton. Much of the book deals with the Civil War and Andrew Johnson’s impeachment (the war takes up most of the book, actually), but this is still a great portrait of the man. The narrative is compelling, and Stahr has a great grasp of the time period. His treatment of Stanton is balanced; while he often bent the rules and occasionally played both sides of the fence politically, he did contribute much to the Union victory. He comes off as brilliant, hard-edged and even compassionate. Stahr describes his control of the press (such as shaping coverage via government telegrams that the press often treated uncritically) and jailing reporters or Lincoln opponents. Stahr also challenges some assumptions about Stanton. He disputes the idea that he viewed Lincoln with contempt during the administration, although the two were not close friends. When one thinks of impactful figures in American history few would come up with the name, Edwin M. Stanton. However, without Stanton the North would have had a much more difficult time defeating the South in the Civil War, the night Abraham Lincoln was assassinated someone else would have had to step forward to round up the conspirators and capture John Wilkes Booth and Jefferson Davis, and perhaps Andrew Johnson might not have been brought before the Senate for an impeachment trial. Lincoln’s S When one thinks of impactful figures in American history few would come up with the name, Edwin M. Stanton. However, without Stanton the North would have had a much more difficult time defeating the South in the Civil War, the night Abraham Lincoln was assassinated someone else would have had to step forward to round up the conspirators and capture John Wilkes Booth and Jefferson Davis, and perhaps Andrew Johnson might not have been brought before the Senate for an impeachment trial. 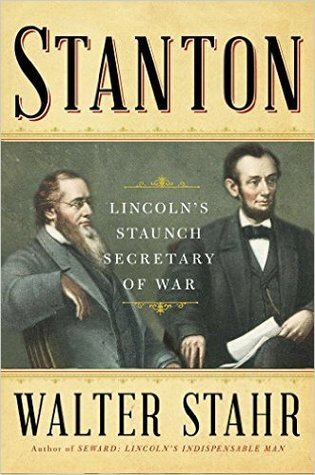 Lincoln’s Secretary of War is the subject of Walter Stahr’s latest biography, STANTON: LINCOLN’S WAR SECRETARY, a smartly written, intimate, and incisive portrait of Stanton’s role in the Civil War and American history in general. As he did in his previous biographies of John Jay and William Seward, Stahr has mined the available sources reaffirming many of the standard opinions of his subject, but also evaluating new sources and developing new perspectives. Born in Steubenville, Ohio in 1814 Stanton was raised near the dividing line between the slave and non-slave states of Virginia and Ohio in a period when abolitionism was beginning to take root. Stanton would attend Kenyon College, but never graduate. He went on to study law under the auspices of a Steubenville attorney, Daniel Collier and began his practice of law in the spring of 1837. Soon Judge Benjamin Tappan, a staunch Democrat would become his law partner and mentor. At this point in time Stanton grew increasingly interested in politics in large part due to the depression that would last over five years. Stanton’s involvement in Democratic Party politics increased and he was soon elected Prosecutor for Harrison County, Ohio. Judge Tappan would soon be appointed to the US Senate and Stanton was well on his way as a partisan Democrat developing a “no holds barred” approach to politics. Stahr has full command of primary materials as he repeatedly points out what documents pertaining to Stanton’s views were available and those that were missing. This allows him to compare diverse viewpoints and sources to determine what Stanton actually wrote, said, or acted upon during his law and political career. Stahr attacks the many myths associated with Stanton and he does his best to straighten out discrepancies in the historical record. In Stahr’s study we follow the evolution of Stanton from an important member of the Ohio Democratic Party to becoming the cornerstone of Lincoln’s Republican administration. During this later process, in particular, we witness the liberalization of Stanton’s views dealing with race. Stanton’s personal life was wrought with tragedy leading to a strong sense of religiosity. As a boy he would lose his father, a brother would commit suicide, and a sister would pass at a young age. Further, in March, 1844 he would lose his first wife to tuberculosis and during the war years he would lose his infant son James. These experiences made him appear decidedly older than he actually was. Stahr correctly stresses that though he was known for his service to a Republican president, Stanton was a staunch Democrat who had supported Martin Van Buren as President, and later James K. Polk’s annexationist policies. Though he had a very low opinion of James Buchanan whose presidency directly preceded the Civil War, he did not think that highly of Abraham Lincoln either during the pre-war period. An area that Stahr should have developed much further were Stanton’s views on race and abolitionism. The author seems to skirt these issues and based on his later beliefs an earlier intellectual roadmap for Stanton’s thinking is warranted. In Stahr’s defense, he does give the appropriate amount of attention to Stanton’s views and handling of the use of blacks as soldiers in the union army and what prerequisites it demanded and how it would be implemented, especially the Freedman’s Bureau. Further, the care and treatment of former slaves is examined and the reader gains a more complete picture of where Stanton stood on these issues especially constitutional amendments. Stahr does spend an inordinate amount of time detailing Stanton’s legal career, seemingly case by case ranging from the Pennsylvania v. Wheeling and Belmont Bridge case arguing that the bridge blocked commerce on the Ohio River designated for Pittsburgh, to land cases in California, patent claims, labor riots, medical body-snatching, death from duels, and electoral chicanery. Stanton would argue many cases before the Supreme Court, and many thought he was the leading lawyer of the period. One of the strengths of Stahr’s effort are his descriptions of American society, culture, and geography in areas in which Stanton lived and influenced. Stahr provides numerous insights particularly concerning California in the 1850s where he argued numerous land claims, and Washington DC before, during, and after the Civil War. Stahr stresses how Stanton seems to always claim the moral higher ground no matter the situation. It is difficult to sustain that approach by supporting the weak President Buchanan and the corruption that surrounded him. Stanton became a member of the Buchanan administration because of his legal work and with a few months remaining in office Buchannan appointed Stanton Attorney-General. The most important issue that was at hand was whether to supply Fort Sumter after South Carolina seceded. Buchanan’s cabinet was split by secessionists and those loyal to the union, and Stanton did his best to stiffen Buchanan’s back and get him to support resupply. Once out of office Stanton’s view of cabinet meetings stressed positions that Republicans would support as a means of strengthening his position with Lincoln. Stahr is on firm ground as he argues that Stanton’s view of Lincoln at this time was not much better than Buchanan. Stahr quotes Stanton’s letter to Buchanan after Lincoln assumes office, “the imbecility of this administration.… [is]…. a national disgrace never to be forgotten….as the result of Lincoln’s ‘running the machine’ for five months.” Stanton’s bonifides are also to be questioned as he was close with General George McClellan and seemed to share the same views. It appeared too many inside and outside the press that they were “confidential friends.” Simon Cameron as Secretary of War advocated arming slaves which McClellan abhorred. With Congress upset over the course of the war by January, 1862 it should not have come as a surprise that Cameron would be fired. What was surprising is that Lincoln chose Stanton as his replacement. Stahr is accurate in his assessment that Lincoln chose Stanton because of his organizational ability, his workaholic approach, and his ability to get things done. Critics, particularly the northern democratic press pointed to Stanton’s extensive use of military commissions that tried civilians for military offenses, suspension of habeas corpus, and cutting telegraph privileges to opposing newspapers. These criticisms of Stanton must be weighed against the crucible of war since the Militia and Conscription Acts did deprive numerous individuals’ due process and civil rights. But one caveat to Stanton’s record on civil rights were the virulent attacks on the Secretary of War which a good part of the time were unmerciful. Stahr does a commendable job revisiting the Andrew Johnson-Edwin Stanton relationship and the deterioration that led to Johnson’s trial in the Senate. As with other examples in the book this aspect is well documented and the “large” personalities and issues involved are careful dissected. The result is that Stahr has captured the essence of Stanton as a man who could be deceitful, arbitrary, capricious, as well as vindictive. However, he was a superb Secretary of War who galvanized Union forces as well as President Lincoln with his energy, organizational skills, ability to learn and adapt, and overwhelming will to defeat the south. Stahr characterizes Stanton as the “Implementer of Emancipation,” as opposed to the “Great Emancipator,” that was Lincoln. But for all intents and purposes Stanton must be seen as the equal to Lincoln and Grant in earning accolades for their work during the Civil War. This book was fascinating. Before I get into the content of the book I want to note that it’s a really well made book. The binding is solid and the paper used is of excellent quality. It really gives you a sort of luxurious experience when you handle the book that made reading it an even greater pleasure. There were three things that I found this book did a better job of illustrating than most books about this period. The book shows a special moment in the history of warfare logistics, provides a This book was fascinating. Before I get into the content of the book I want to note that it’s a really well made book. The binding is solid and the paper used is of excellent quality. It really gives you a sort of luxurious experience when you handle the book that made reading it an even greater pleasure. There were three things that I found this book did a better job of illustrating than most books about this period. The book shows a special moment in the history of warfare logistics, provides an example of how Lincoln inspired loyalty, and shows how some people’s racist views during the period evolved. Scientific developments during this period had their biggest impact on the frequently overlooked bureaucratic and logistical sides of warfare. With the use of telegraphs and railroads, the Union army was probably the best supplied and best informed army in the history of the world up to that point. Learning about the work Stanton put in to move troops to defend Chattanooga is fascinating b/c you see the creativity and might the Union had and how the use of these new technologies was not obvious and took time to develop. Stanton worked tirelessly with civilian and military leaders to perfect these developments. Stanton and the Union quartermaster Montgomery Meigs definitely have a lot to teach anyone involved in logistics. The description of his relationship with Lincoln follows a similar pattern to other cabinet members. Their relationship started as one of contempt, Stanton thought of Lincoln as a country bumpkin and was condescending and rude and over the 4 years that he worked with Lincoln he came to venerate him and have a deep love for the President’s bravery, empathy, and intellect. This is similar to the process Seward and Wells went through and it’s amazing to see Lincoln’s charisma take hold on three such different personalities. There really was something almost providential about Lincoln. The last aspect of the book was interesting and provides insight into how racism slowly changes in the U.S. Stanton went from a man who bragged about slave ownership in his extended family to a man who was adamant about voting rights for black citizens. Although he had a propensity of telling people what they wanted to hear and had told Democrats one thing and Unionists another on important topics like abolition and the defense of Fort Sumner I believe this was a real change in his belief about citizenship and black people as human beings. He saw daily the work that black troops did in defending the Union and when he was given choices that would have been more politically popular, like trading only white prisoners of war, he refused. He understood the importance of guaranteeing black Americans the vote b/c that was the only way they could defend their hard fought liberty. Stanton’s character is interesting b/c he was pompous, stubborn and egotistical but he was an amazing learner. His ability to apply the lessons he learned, whether in logistics, his estimation of an individual, or his recognition of the humanity of black Americans was forceful and a good lesson to learn from his life. Stanton served in the cabinets of both President Buchanan and Lincoln; was the Secretary of War for much of the Civil War; and his attempted removal triggered the Andrew Johnson impeachment. Any of these reasons make him an interesting figure for study, but all three highlight him as one of the pivotal figures in US history in the middle of the 19th century. Stahr has written a biography worthy of Stanton's importance. Stahr looks at Stanton's roots as a Democratic political figure and his time Stanton served in the cabinets of both President Buchanan and Lincoln; was the Secretary of War for much of the Civil War; and his attempted removal triggered the Andrew Johnson impeachment. Any of these reasons make him an interesting figure for study, but all three highlight him as one of the pivotal figures in US history in the middle of the 19th century. Stahr has written a biography worthy of Stanton's importance. Stahr looks at Stanton's roots as a Democratic political figure and his time as a lawyer in Ohio and Pittsburgh - he made a number of contributions on these roles, and gave Stanton the prominence to become a candidate for cabinet figure. Some of the interesting themes that emerge in Stahr's biography are Stanton's transition from leading Democrat to a figure that Radical Republicans sought to protect from Andrew Johnson. Another interesting theme is Stanton's ability to navigate between disparate figures such Salmon Chase, Seward, and Thaddeus Stevens. Before reading this book I knew very little about Edwin Stanton other than he was Lincoln’s war secretary and that he was present in the room when Lincoln died and was reported to have said, “Now he belongs to the ages.” However, after reading it, I have a great and new appreciation for the role Stanton played at a pivotal time in the history of the country. While Stanton was not above manipulating the rules and laws to achieve a goal, he was certainly a man who personifies the descriptive phase, Before reading this book I knew very little about Edwin Stanton other than he was Lincoln’s war secretary and that he was present in the room when Lincoln died and was reported to have said, “Now he belongs to the ages.” However, after reading it, I have a great and new appreciation for the role Stanton played at a pivotal time in the history of the country. While Stanton was not above manipulating the rules and laws to achieve a goal, he was certainly a man who personifies the descriptive phase, “a public servant,” unlike many who boast of being that today. He spent long, long hours on the job overseeing the Union armies in the field and providing them with necessary war materials, food and clothing. His sacrifice of a promising legal career is most noticed in the fact that less than a year before his death and in failing health, he had to borrow $5,000 to live on. His salary as war secretary had been $6,000 annually. At his death he left behind a widow, three young children and almost no assets. In 4 months after his death Stanton’s friends had raised $150,000 for a fund for his wife and children. His sacrifice was not unnoticed. Stanton was a complex man and, much like the president whom he served, an unlikely figure playing a vital role in preserving the Union. This was one of the first biographies that treated its subject as human. From the first chapter, you knew Stahr was not simply fawning over Stanton, but still respected him. Stanton was a complex and complicated political figure who knew how to play the game and get things done. When he said he would be loyal to a person, position, or ideal, it seemed he was and would do what was necessary. Stahr showed all sides of the major actors in Lincoln's presidential cabinet. All men, including Abe himsel This was one of the first biographies that treated its subject as human. From the first chapter, you knew Stahr was not simply fawning over Stanton, but still respected him. Stanton was a complex and complicated political figure who knew how to play the game and get things done. When he said he would be loyal to a person, position, or ideal, it seemed he was and would do what was necessary. Stahr showed all sides of the major actors in Lincoln's presidential cabinet. All men, including Abe himself, had their strengths and their foibles. Seward shifted politically and often turned on his friends. Sherman was hesitant to engage the Confederates. Grant was a leader who drank more than he should. Lincoln occasionally didn't fully trust his generals and micromanaged them. And at the center of the story, Stanton was proud, stubborn, brash, cunning, manipulative, over-worked, and often said what he thought others wanted to hear to agree with him. A good biography of Edwin Stanton. The author recognizes the good and bad qualities of Stanton and demonstrates this in the book. A number of primary sources were used in the research of this biography as well as secondary. A thorough examination of Stanton and very enlightening. I did not know much about Edwin Stanton before reading this book and found the book interesting and engaging. Highly recommend this book. It was a little dry and at times tough to get through. Some of it was really fascinating; a lot of Stanton's legal career was a chore to get through and a few times I found myself asking "who cares?" I agree with Stahr's conclusions though that Stanton was an efficient, incorruptible war secretary that was an important piece to Union victory, yet Stanton was also a flawed, cantankerous, and overzealous man. Stahr’s work here, much like in his biography of Seward, goes a long way towards reviving the memory of a pivotal figure in the war. Works such as these are a necessary corrective to the narrative of the war that recalls only Lincoln and the Generals. The book is well-researched and paced. It moved briskly through the life of Stanton, but while illuminating his entire life. Very excellent book on Edwin Stanton Lincoln's War Secretary. After Lincoln and Grant possible the next one who saved the Union. Stahr makes this a very enjoyable and easy book to read, similiar in scope to his Seward book a few years back. Besides his dealings with Lincoln I thoroughly enjoy the part where he was also Johnson's War Secretary and the bitterness/disagreements between these two individuals. Of the thee books by Stahr, Seward is the best, but this is a close second. The section of the book dealing with Andrew Johnson and Johnson's impeachment process is an absolute gem. Makes reading this book worth the time and effort. His history under Buchannan and how he became involved in the Lincoln Cabinet after serving on Buchannan's helps make him real. I guess I didn't know what to expect when I began reading about Stanton. I am from Steubenville, like Stanton, and although I have seen his statue in front of the County Courthouse, I really didn't know much about him. Well, not anymore! Wonderful details and descriptions of a the most difficult time in our country's history. This is a complete biography of Stanton. His strengths helped Lincoln and the North win the Civil War. He had weaknesses and this is in the book too. A great reference book, and great read for Civil War and History fans, enjoy! An interesting look at a man called to solve many logistical problems and also work with many of the great ego's during the Nation greatest crisis. American history scholars ought to read this important book to understand the period and many little known persons in our History. Great American whose priority was saving the Union. Stage is a wonderful writer. Excellent biography! Well written and thoroughly researched. Too heavy on the war not heavy enough on the Freedman's Bureau and Reconstruction. Still better than the other recent Stanton bio (from what I read of that).